Treasure maps are a great idea for children’s parties, I have used them many times with my children. Or if the children are stuck for something to do on a rainy day they love making a treasure map up themselves and then playing a pirate game acting as Captain Jack Sparrow or pretending to be Indiana Jones around the house. 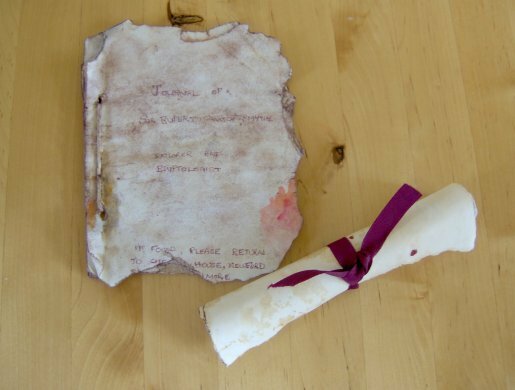 The last treasure journal we made in our house gave clues to various rooms where they found another clue that lead them to discover which page in the treasure journal they needed to go to next, it took them all around the house before ending up with their treasure. The treasure can be anything from a bag a chocolate coins to their mound of presents on Christmas morning. Clues can be as easy or as hard as you like, much depends on the ages of the children playing. They might have to unravel a cryptic clue or complete a task like singing a nursery rhyme before moving on to the next clue, this makes the treasure hunt more exciting and last longer! The great thing is it doesn’t matter how old the children are they still love to hunt for treasure, they may say that they are just helping the younger ones but I know they never really grow up! 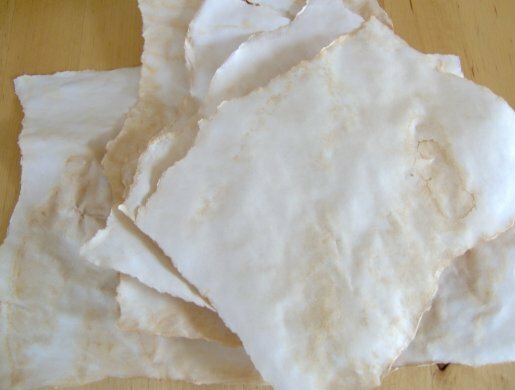 Making the paper will need help from an older person as it is dried in the oven but it can be made in advance ready for a rainy day or in preparation for the next party. 1. 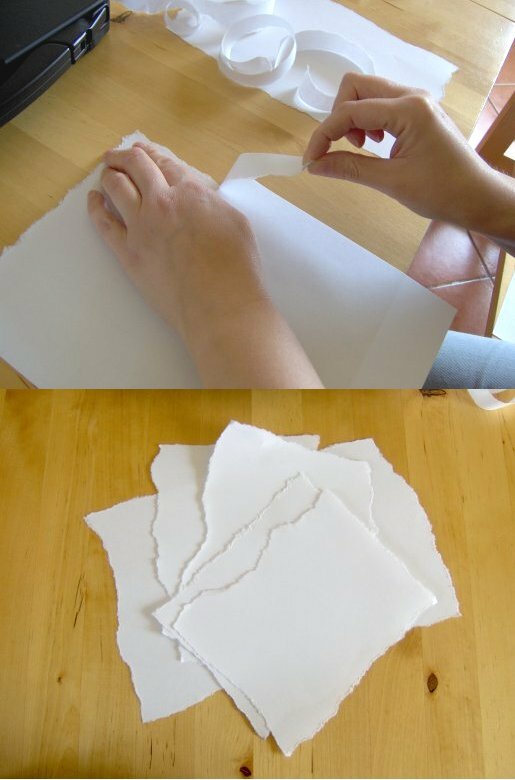 If making a treasure map you will need a larger piece of paper, I have used A4 printer paper, if you have larger pieces then that’s great, tear the sides so they are rough and jagged. For a treasure book you will need smaller pieces of paper roughly the same size, about A5 size (A4 torn in half) works well with the sides rough and jagged. 2. Make some black tea and pour it into the base of a shallow dish. Put in a piece of paper totally covering it on all sides. 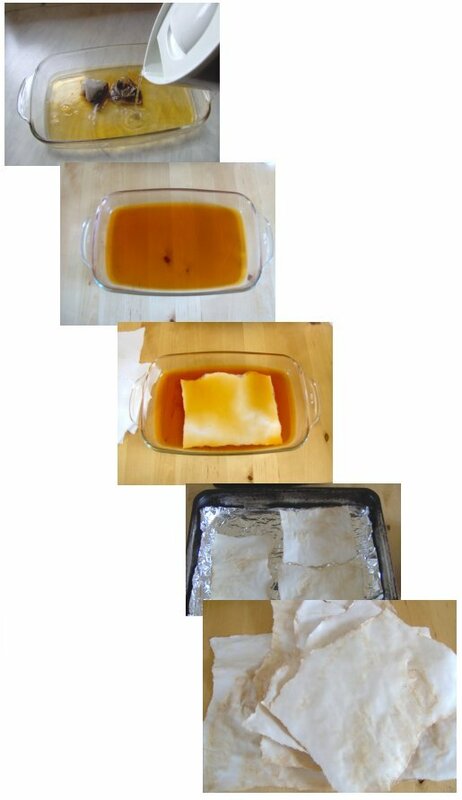 Take it out and place onto a foil covered baking tray, do not put the paper directly onto the shelf in the oven or you will be left with lines on the paper (I know because it’s what I did the first time I had a go!). Put the tray of papers into a warm oven to dry (in my fan oven I set it to 100°C, this takes about 10 minutes, turn them over after 5 minutes. When they are dry they will be a little crispy and may have curled a little (this adds to the authenticity). The paper can be used as soon as it is dry or you can put it up somewhere safe ready for a rainy day. 3. Now you let your imagination run wild making up your treasure map or journal using pens, pencils and paint. You can add some brown paint on the edges to age the paper even more, add a dirty thumb print and a little red paint (blood) to show the action the map has seen, the map can be of an actual place (the inside of your house etc) or one from your child’s imagination just for fun. When it is complete and dry, roll up the map and tie with a piece of string or ribbon. For the journal make a small hole or a couple of holes in the middle left hand side of each piece of paper and thread through some string or ribbon to tie them together.